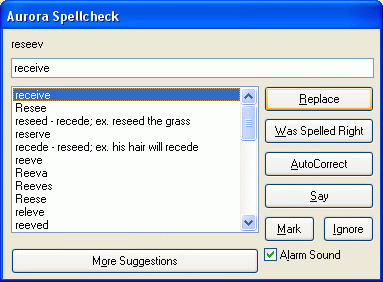 Aurora Suite contains several features designed to help poor spellers, each of these is discussed briefly below. Since the dictionary size is practically unlimited (roughly 1 Million words), nearly any word you might want to spell (roughly 125,000 words including more than 20,000 names and places in the prediction dictionary) will already be in the dictionaries. The standard dictionaries shipped with Aurora Suite contain a number of Spelling Autocorrection text macros. These macros make Prediction correct commonly misspelled words automatically as you type, like "recieve" to "receive". You can even automatically convert your spelling errors into automatic spelling corrections, find out more under the Log Spelling Errors feature. Prediction has the ability to guess words that sound like a word you are spelling if the word you are typing is not in the dictionary. Typically this helps if you are spelling a word incorrectly by offering you the correct spelling in the prediction window once you have typed most of the word. See Prediction Options for more information. These phonetically similar words appear as blue words in the Prediction window. Aurora Prediction can check the words you type to see that they are in its dictionary and spelled correctly, and if not, ask you to correct the spelling or add the word to the dictionary as you go. Unlike the spelling checkers in commercial word processors, it can read the selections to you to help choose the correct word. See Prediction Options for more information. Aurora Prediction can spell check any text that you copy to the clipboard so that you can mark a passage in your document, copy it to the clipboard, spell check it, then paste it back into your document to make the corrections permanent. See Prediction Options for more information. Aurora Prediction allows the user to display up to 6 31 extra words at the bottom of the Prediction window that can only be selected by clicking on them with the mouse. These words can help if a poor speller can get the first two or three letters of a long word by allowing them to see the word earlier than if only the top 6 or 9 words were shown. You can get more information in the section Spell as you Type.